I was approached by friend, Joe Castro, about creating an install for his bagged Passat after he previously saw Morio’s ’01 Audi TT custom install I completed. 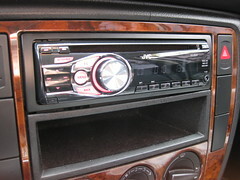 Joe wanted to complete his audio install that stems from a JVC KD-R320 head unit. 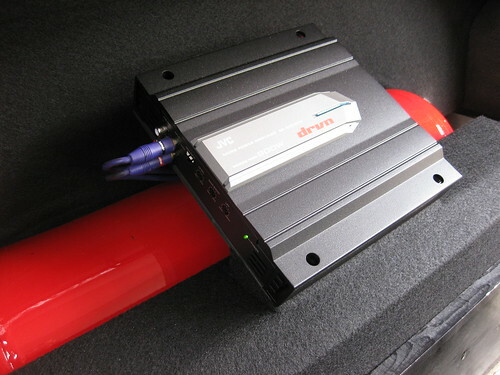 After doing some research, and approaching the install as an “all matching” set, I proposed using JVC’s drvn series KS-AX3101D 400 Watt RMS mono amp and getting the bottom end from their 12″ 4 Ohm Dual Voice Coil drvn series CS-GD1200. 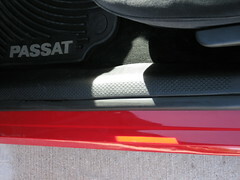 The Passat was previously wired for an amp, along with the AccuAir SwitchSpeed controls. 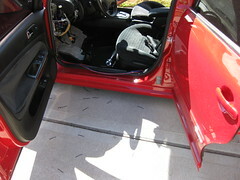 My OCD led me to rerun the wiring and tidy things up a bit to ensure an almost stock appearance to the door base trim. Some sweat and plenty of zip ties had things straightened right up. I then proceeded to hook up the remote wire to the JVC head unit. A quick power check ensured the amp would be online when requested. 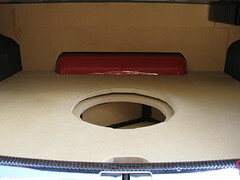 As you can see from the photo of the “blank canvas” I was already limited by the confinements around the install of the air ride components, and to add to the limitations, Joe wanted to retain his spare tire. After some sketches and a CAD drawing were created, I was able to squeeze out 1.08 cu ft of volume. PERFECT! 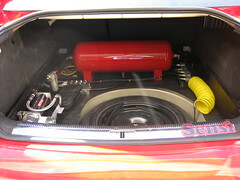 This was close to JVC’s recommended 1 cu ft and < the max 1.5 cu ft enclosure, allowing the sub to kick hard and go low…just like the BagYard Bombers. 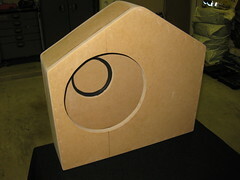 Building the enclosure went smoothly, as well as creating the false floor and rear wall. 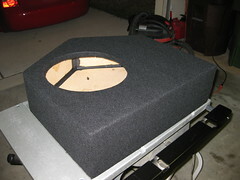 Originally the idea was to flush mount the amp to the false wall, however there was not enough space to do so. After coming up with a few alternatives, I contacted Joe and provided some pics and chose to go with a custom amp rack that would allow access to his air system components and provide a clean solution. 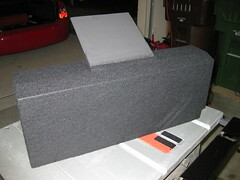 Once the test fits were completed, the amp rack and enclosure were wrapped in black felt. 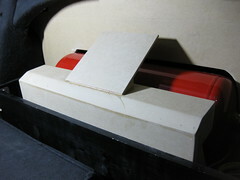 Then the enclosure was filled 50% with poly-fil to provide smoother bass response and “increase” the total volume. 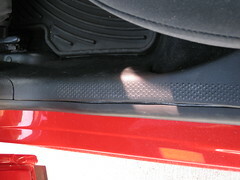 Then the false floor and false wall were finished with batting and black suede. 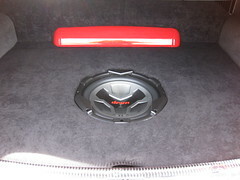 After final installation, the amp and head unit were tuned to create a great sound stage despite having the original factory speakers to count on. Needless to say, I was very impressed. Upon Joe’s arrival to pick up his vehicle, we discussed all the key areas about the install and clean up of his car. It was then time to immerse him in a new audio experience from the cockpit of his daily driven Passat. Smiles ensued.